The new M855A1 round replaces the current M855 5.56mm cartridge that has been used by U.S. troops since the early 1980s. The M855A1 resulted in a number of significant enhancements not found in the current round, which include improved hard target capability, more dependable, consistent performance at all distances, improved accuracy, reduced muzzle flash and a higher velocity. Courtesy photo via U.S. Army. On June 23, 2010, U.S. Army representatives announced that they had started shipping that service’s new 5.56mm cartridge, designated the M855A1 Enhanced Performance Round, to support warfighters in Afghanistan. The new M855A1 round, which will replace the current M855 5.56mm cartridge that has been used by U.S. troops since the early 1980s, is sometimes referred to as “green ammo” since it contains an environmentally friendly projectile that reportedly eliminates up to 2,000 tons of lead from the manufacturing process each year. The Army launched the M855A1 program in September 2005 as a Congressionally mandated initiative to replace the lead core M855 cartridge. In addition, the program focused efforts on developing a new round that would address what service planners dubbed “perceived shortcomings” with the current M855 used in short barreled weapons like the M4. According to program participants, the program team, comprised of Project Manager, Maneuver Ammunition Systems (PM-MAS), Army Research Laboratory (ARL), U.S. Army Armaments Research Development and Engineering Center (ARDEC), and ATK team members, evaluated more than 20 potential projectile designs before moving forward with a three-piece, reverse-jacket bullet design incorporating a hardened steel penetrator and lead-free slug. While Army representatives highlight ballistic test results for the new M855A1 cartridge that showed “improved performance over M855 at both long and short ranges, and across an array of target sets,” the round raised eyebrows following recent reports that the Marine Corps dropped plans to field the M855A1 in favor of fielding the special operations’ MK 318 Mod 0 for Marines in Afghanistan. 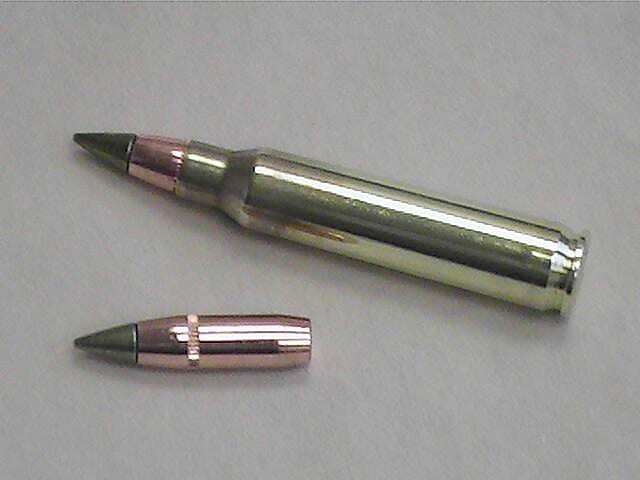 The M855A1 uses a reverse-jacketed copper projectile with a hardened steel tip and contains no lead. Courtesy photo via U.S. Army. U.S. Army Project Manager, Maneuver Ammunition Systems Chris Grassano called the fielding “the culmination of an Army enterprise effort by a number of organizations, particularly the Army Research Laboratory, Armament Research Development and Engineering Center, Program Executive Office for Ammunition and the Joint Munitions Command. “The Army utilized advanced science, modeling and analysis to produce the best 5.56mm round possible for the warfighter,” he said. The M855A1 is tailored for use in the M4 weapon system, but is also credited with “vastly” improving the performance of the M16 and M249 families of weapons. Pointing to “more than one million” M855A1 rounds fired during testing to date, program representatives noted that the new cartridge recently completed the limited rate initial production (LRIP) phase and is beginning the follow-on full rate production phase where they plan to procure more than 200 million rounds over the next 12-15 months. Soldiers in Afghanistan will begin using the M855A1 in the summer of 2010. So WHAT ARE the specific Improvements in the Cartridge??? Steel nose, WHAT ELSE, what is it composed of if not lead? What Grain prohectile, Grains & Type Powder? What are the estimated penatration depths, spread and ballistic characterists? For an article slated for Defnse Personnel, it sure lacks specifics of the item be hailed. It’s still a 62 grain round, but longer, which is probably what improves the range performance. Steel tip with a copper-jacketed tin-bismuth alloy core. No wound channel/gel test results that I have seen. What I have seen are released hard target penetration test results for 3/8 inch steel and masonry block. From your email address I’d guess you’ll be more interested in M16 than M4 data. From an M16, the M855A1 will penetrate the 3/8 inch steel at 450 meters, and a masonry block at more than 100 meters. By comparison the M855’s figures are just north of 200 meters and approximately 0 meters, respectively. M4 performance is naturally worse. America is truly great. We even kill people the green way. Are these the Same Green tips I Buy At lake city brand For My M4 Delton? PMC Also Makes A 62 Grain Green Tip,, Are Those The Old M588s? The short answer is no. The M855 green tips are not the same as these new rounds. The M855A1 in the story has a new steel tip over a reverse-jacketed copper projectile. While I haven’t checked to see whether ATF call them armor piercing, I doubt they’ll ever be available to the general public.